It has been a good week… a very good week to say the least. Our Monday ultrasound got moved to Tuesday due to the holiday weekend and we were anxious to find out what was going on with the girls. 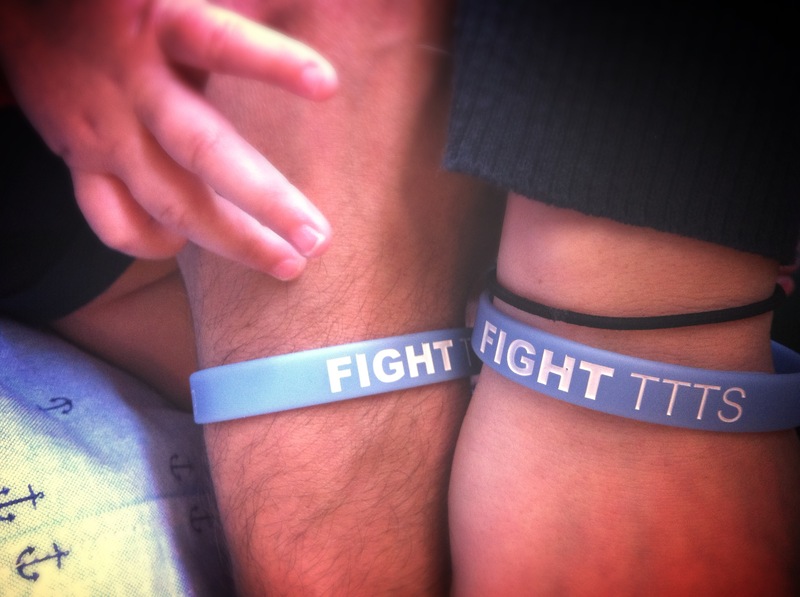 We had received good reports the week prior and MaK and I were curious to find out if the pessimistic doctors’ negativity was actually the reality of the TTTS diagnosis. I guess in order to accurately describe what happened today I’ll have to start at the beginning of our diagnosis and go from there. On May 6, we spent about ten hours at Cincinnati Children’s hospital having an MRI, high level ultrasound, and echocardiogram performed on MaK and the girls. After the MRI and ultrasound, we got a call from our nurse informing MaK that she should not eat anything until our final consultation. Based on the results from the testing thus far – they expected us to be in the operating room by end of day. At the time, the nurse didn’t explain anything further and just reiterated that we would have a consultation with the specialist(s)/surgeons after our last test. We had no idea what was going on. We had no idea why we might need surgery at the end of the day. And we had no idea what the results of the tests were. Going into this day, MaKenzie and I prayed that we would not hope or despair in anything the doctors told us. We would not worry and we would walk through this hoping in the Lord and resting in the fact that He is in control. Around 4 in the afternoon we finally got to meet with our team of specialists. All our tests were completed and we had just been sitting around for about an hour or so waiting for our consultation. Our hearts were heavy and we were pretty sure that MaK would have surgery that night. We met with a maternal fetal specialist, another doctor (I don’t remember his fancy title), our nurse and a liaison for the hospital. It was a pretty intimidating meeting. They had all of our tests pulled up on a projection screen and through a series of detailed reports and images, they began to give us the prognosis. In Twin-to-Twin (TTTS), there is a “donor” and “recipient” – the donor baby is the smaller of the two who is essentially sharing too much with the “recipient” baby, who is larger and receiving much more blood and nutrients. They told us that the donor baby had less than 2 cm of amniotic fluid and the recipient had around 17 cm (average is around 5-6 per baby with identicals, but can range some). With that knowledge, it was obvious that one twin was working extra, extra hard to process the extreme excess fluid in her sac and her heart was showing signs of being overworked. In turn, the smaller twin wasn’t getting what she needed in the process. The specialists’ diagnosis was that our girls had Twin-to-Twin Transfusion, a very serious (and extremely rare) condition that happens only with identical twins. Without any treatment, the mortality rate of TTTS is 80-100%. At the end of our consultation I asked the doctors if they ever saw this condition right itself, or if the fluid levels could ever even out “on their own”. His response was, if they diagnose it as true Twin-to-Twin (which they had), the fluid levels never equal out and medical intervention is necessary for the best chance of survival for the babies. He said they found enough evidence that suggested that our girls were currently in Stage 1, with a forecast of progression on the horizon. The TTTS can progress quickly or remain at a plateau at any moments notice. The good news from that day was MaK did not need to have any immediate procedures and we could go home and continue to pray for God to heal. The following Monday we had another ultrasound to see if the symptoms were still progressing. The tests showed that the twins still had fluid levels of 17 and 2. Our doctor came in after the ultrasound and basically explained to us that we should do an amniotic reduction because it is the first step in battling this disease and that we were on a time crunch for a number of different reasons. We asked for a couple minutes to talk over what we wanted to do. It wasn’t that we didn’t want to do medical procedure, it was the fact that if we did a medical procedure it felt like our hope would transfer from God to the procedure and we were desperately trying to hope in the Lords healing. MaK and I said a quick prayer and asked God to not let us step outside of His will for this situation and that He would be clear on what we should do. After a couple minutes the doctor came back in and we told him we would do the amniotic reduction. He looked at us like we were crazy and said “why?” We were flabbergasted he reacted this way. Just 5 minutes ago he was telling us we needed to have the procedure done. His response surprised us, “Even though I’d get paid for this procedure and it’s no sweat off my back, I know you both are uncomfortable with doing this right now, so why don’t we just wait a few days?”. WOW… answered prayer!!! 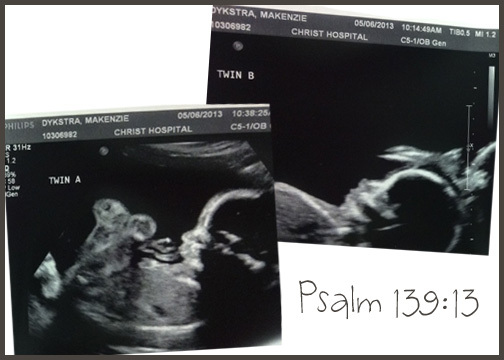 Later that week we found out that even though the fluid levels had not changed it looked like we were progressing into stage three of Twin-to-Twin but still no procedures were necessary. All of this leads me to yesterday. We had our ultrasound Tuesday morning and the girls fluid levels were at 5.5 and 5.6… an almost identical measurement, something all the specialists had ruled out as impossible to happen naturally. Ever since we received the diagnosis just one week ago that it looked like we were entering into Stage three, our girls’ have been slowly but surely sharing with one another (that’s what MaK and I keep saying). Literally, one is decreasing so that the other might increase – so that both can grow. This trend has been so obvious that every time we go in for our bi-weekly test the medical teams that perform our ultrasound keep asking if we’ve had any procedures and when we tell them no… they can’t believe it. Our medical team can’t explain what is going on, in fact at the last appointment one of the doctors kept shaking his head and saying “I don’t know, I just.. I don’t know… this is not medically possible”. There’s no “out of the woods” with Twin-to-Twin Transfusion Syndrome. It is a battle that carries a lingering unknown with each new day. Progression can occur at any moment in the pregnancy. Today, though, and this week, we are recognizing that our Healer is on the move and we are thankful for the three, healthy growing Dykstra girls that God has entrusted to MaK and I. Maebyn and her sisters have a story to tell and we pray that we are able to lead them and love them the way our God is so deeply loving us through this journey. It’s His story after all, not ours.